On Saturdays I like to sleep in a bit and then laze my way into the kitchen and make a yummy brunch meal. This past Saturday one of my good friends was visiting and I made us a vegetable frittata and some cherry bread. Frittatas are one of my favorite breakfast foods since you can add in as many delicious vegetables as you want and you get some good protein from the eggs. Plus, many breakfast foods are sweet, so this is a nice change up. Below is how I made the one last Saturday (amounts are approximate), but it is easily adjusted to your liking. The cherry bread is a Jamie Oliver inspired recipe, as I got the idea paging through one of his cookbooks the other day. It turned out pretty good, but I think I would prefer it more as a quick break, coffee cake style. First, in order to speed the cooking of the potatoes up (another good thing is to use leftover oven fries or hash browns) I put a little bit of water into the skillet and boiled/steamed them until they were just tender (you don’t want them falling apart). Then, drain the water, leaving the potatoes in the pan. Preheat the oven to broil. Next, add the olive oil and the other vegetables and sauté until tender. Season veg with a sprinkling of salt, pepper, garlic and Italian seasoning. In a separate bowl, beat eggs and mix in some salt and pepper and the Parmesan cheese. Pour the egg mixture over the vegetables and stir to combine. Let cook for a few minutes, until the eggs start to set. Then, transfer to the oven for 4-5 minutes, until the top is golden brown (keep an eye on it, the broil setting can burn fast!). 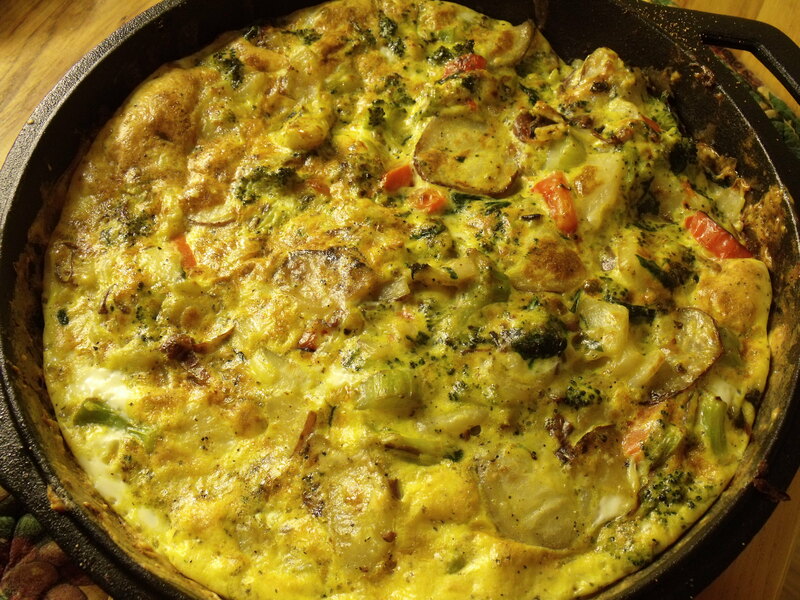 Especially if you are using a cast iron pan, immediately transfer the frittata onto a plate, so it doesn’t keep cooking and dry out the eggs. For the bread base I used a basic, versatile bread recipe with a little extra sugar. I plan on posting that recipe in a few days. I mixed it together the night before and let it rise in the fridge overnight. In the morning I took it out and pressed it into a small baking dish. Then, to speed up the time of the second raise, I turned the oven to warm and boiled a small amount of water in a pot. Then, I turned the oven off and put the pot on the bottom rack. I let the bread raise in the warm, moist oven. While it was rising, I mixed about a cup of tart cherries (frozen ones that my amazing mother picked up in Michigan and brought down to me last summer! Thanks mom!) with a couple spoonfuls of sugar and a teaspoon of vanilla. 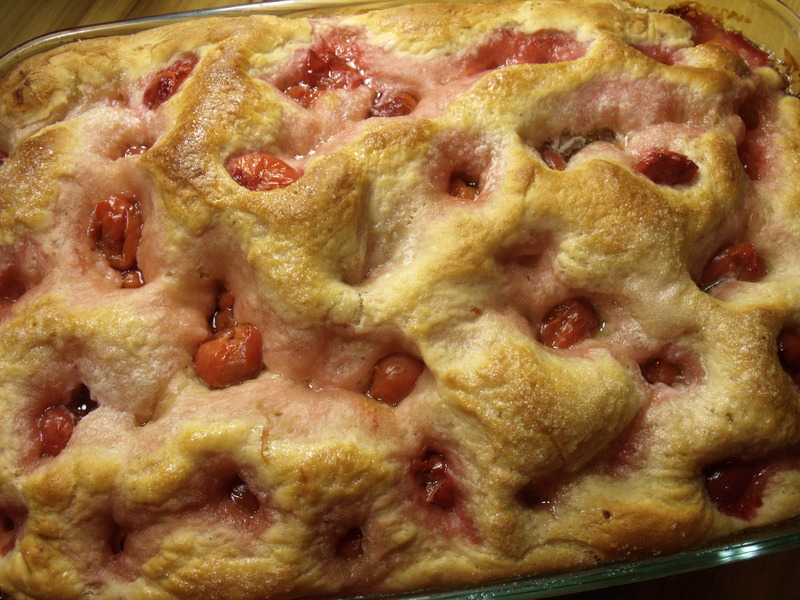 After the bread had finished rising, I sprinkled the cherries on top and individually pressed them down into the dough. Then, I sprinkled some more sugar over top and laid on about 5 small pats of butter. Baked it at 350 for a little over 20 minutes. Ate it with a little bit of cream cheese and it kind of tasted like a cherry danish! I love the Frittata! I love all the veggies and the way you mix the egg and cheese! And I will try it this weekend when I get back to me oven. Besides, I want to share with you another veggie main dish: vegetarian moussaka. Check it out! It’s delicious! Thanks! Let me know how it goes if you try it! That Moussaka looks really good too. I’ve been looking for different ways to use quiona, so i’m definitely going to have to try it. thanks!